I have often joked that if I was ever Prime Minister, before I even imagined tackling the problems with the NHS and the economy, I would deport Bill Oddie to Serbia. You see, ‘Batchelor’s Britain’ would set out to create the perfect world, and in that perfect world Bill Oddie wouldn’t be on television. His on-screen costume of a practical fisherman’s ‘gillet’ and scraggy beard is the epitome of a can’t be bothered attitude and, truth be told, he looks a bit like a beaver with glasses. Now you are probably shouting: ‘What’s wrong with uncle Bill? He’s never done anything to you!’ Readers may well be retorting with: ‘I loved him on that Springwatchdog programme with Kate Humble…leave the man alone’. Unfortunately, however, it would seem that my mild dislike for Bill is backed up by the Mirror who recently revealed that Kate Humble prefers Chris Packham to Bill as co-presenter on Springwatchdog, and the chairman of the National Pest Technicians Association, Peter Croden, believes that the reason for the fox attack on those two babies recently was due to “People think[ing] that foxes are fantastic, beautiful cuddly animals because of Springwatch and Bill Oddie”¹. Apart from Springwatchdog, Bill has done many things including acting and writing, and Wikipedia even describes Bill as a musician and a bit of a painter. However, more famously though, Bill Oddie will forever be burned onto the brains of a certain generation for being part of the 1970s television comedy, The Goodies. And this brings me onto the new Mercedes-Benz R-Class which was re-launched this week, although you’d never know it – I went on Mercedes’s website today to have a look at it but they are still advertising the old one. I can see why they haven’t bothered as the new R-Class still has the same identity crisis. Yes, the old R-Class’s unfortunate facial-similarity with a mildly surprised rhino may well have been replaced by a more attractive grille, and yes, if you look closely, the bumpers are a slightly different shape. But the ‘R’ still doesn’t know what it is trying to be. Is it an estate car? Well yes, but it doesn’t have the sophistication of the Mercedes E-Class estate. Is it a 4×4? Er…no…it’s not as agile off-road as the M or the G-Classes, and neither could the R-Class be seen to be an S-Class-like limousine; trying to get out of it would be far from graceful. 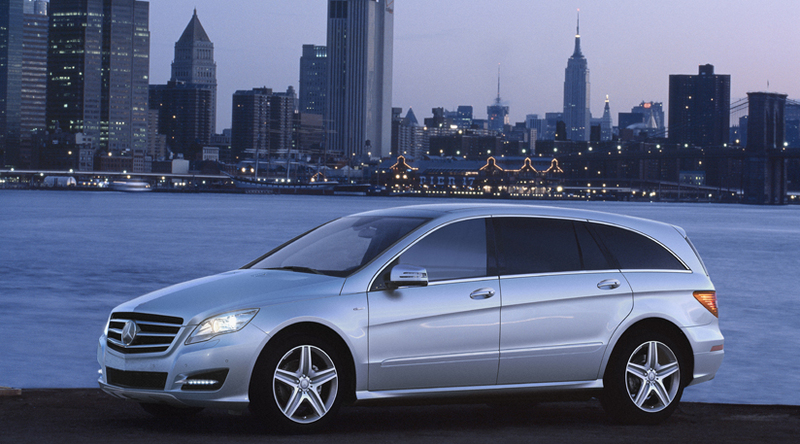 In a perfect world the new Mercedes-Benz R-Class would be the perfect car – a limousine-come-4×4-come-estate car. However, as is so often the case, things that combine wildlife with the ‘Funky Gibbon’ turn out to be less than desirable. On the radio: Anything….just not a song by The Goodies. Batchelor says: Proves that a car cannot do everything.